One of my favorite cheap eats in the city is Halal food, affectionately known as "street meat" or "street cart food". 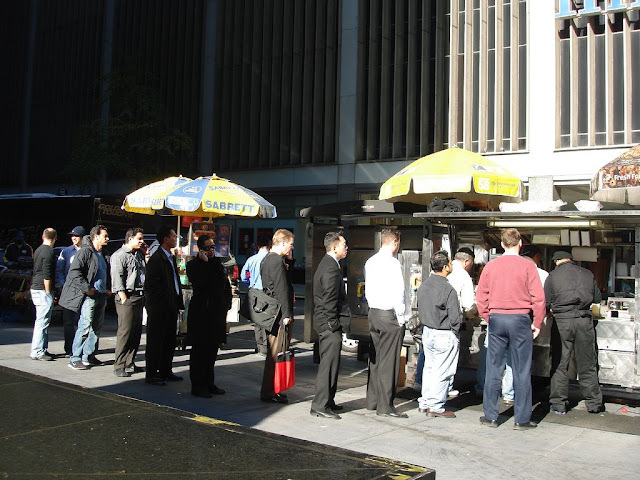 Like their hotdog cart counterparts, these food carts are ubiquitous. The lamb platter is the staple. You don't go to a steakhouse and order the tuna. Likewise, you best order the lamb platter here, or kindly step out of line. It comes with chunks of lamb-beef-meatlike objects cooked with peppers, some lettuce and sliced tomatoes, and a nice helping of white and red sauces. The one I went to about an hour ago also has carrots in the salad, and fresh dill for the meat. That's considered gourmet compared to the rest of the Halal circuit, so I feel very fortunate to have it close to work. It's at Third Avenue between 85th and 86th Streets. I also recommend Rafiqui's at 40th Street between Madison and Park Avenues - right by my old office. No deeper themes here, just paying homage to a New York City tradition. You're a braver man than I, Mr. Lai.